Things looked good as United raced upfield and almost scored within 30 seconds of Thistle kicking off with Paddy Connolly teeing up a chance for Craig Brewster who drilled in a shot from the edge of the box which Nelson could only parry for a corner. Even with three changes in the side, Paddy Connotly, Craig Brewster and John O'Neil coming in for the absent trio of Jerren Nixon, David Hannah and suspended Christian Dailly, the tangerines dominated the early stages. But from the moment Thistle went ahead in albeit fortuitous circumstances in the 14th minute, the tables were very much turned on United. Gordan Petric barged Smith off the ball as the Serb was ushering the ball over for a goalkick and from the penalty Guido van de Kamp was beaten by Charnley. 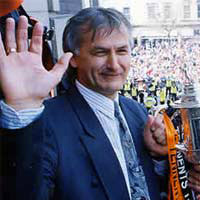 Partick then threatened to run riot as they sliced through the Tannadice rearguard on three occasions and only two tremendous saves by Guido van der Kamp twice prevented English from 'scoring and it took a timely intervention from Gordan Petric to block an Alex Taylor shot from counting. Earlier Brian Welsh had a header cleared off the line and Craig Brewster headed just over as the ball bobbled about the box after a Billy McKinlay corner. None-the-less, it still came as something of a surprise as United raced into an interval lead thanks to two goals in as many minutes. 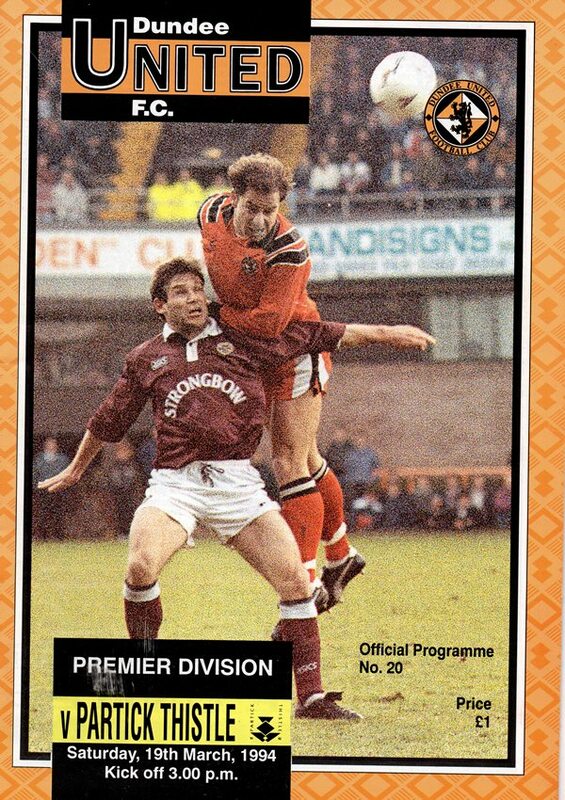 First, Craig Brewster headed in John O'Neil's right wing cross from Billy McKinlay's corner. the far post and he rammed the ball into the roof of the net for his first goal of the season. 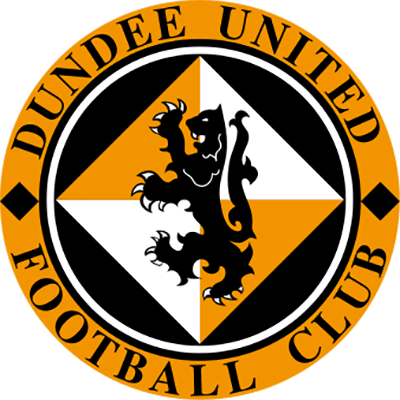 But even going ahead failed to fire the tangerines in the second half and shortly after Billy McKinlay drove a volley just over Thistle equalised when Willie Jamieson stooped to head home a Charnley free-kick from just inside his own half. On Tuesday evening we turned in a thoroughly professional performance to claim a place in the semi-final of the Scottish Cup. We worked well as a unit and perhaps the most pleasing thing at the moment is that we are running into form at the right time as the season reaches a climax. Having established a two goal lead, unlike too many games in the past this season, we kept a tight control of the game and were never in any danger of not winning the tie and that for me was one of the most pleasing aspects of the night. I am also delighted that we have now reached the semi final of both domestic cup competitions in my first season. However, as I told the lads in the dressing room after Tuesday's match with Airdrie, any thoughts about the forthcoming semi-final with Aberdeen must be put to the back of their minds because all their thoughts and concentration have to be centred on the vital league games we have coming up before that cup date. I am still very confident that we can do well in the league and a win this afternoon is vital if we are to climb up the table. Certainly, I was far from pleased with our performance the last time Thistle were here when only Scott Crabbe's late equaliser salvaged a point for us. We showed improvement in the atrocious conditions at Firhill before Christmas but lost when we deserved better, but in a way this was a case of things balancing themselves out. 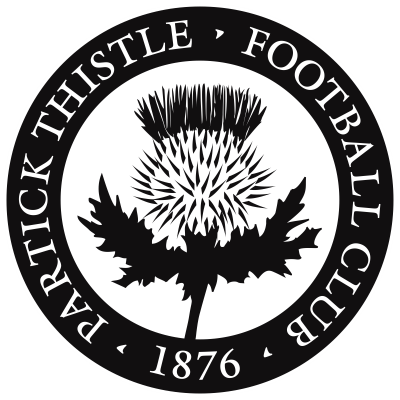 But as we take on Partick Thistle this afternoon I can assure all our fans that we will be single minded in our approach to this afternoon's game, because victory is our sole aim.